So now, Bitly introduces a complete new, well, everything: New design, features, logo, profiles, search tools, mobile app and more. Some have already referred to the new Bitly as a “social network” I don’t think it is a totally accurate definition, although it is obviously now presents more social features. If I’ll have to summarize it in one sentence Bitly now became a sort of deep social layer of links, kinda like Reddit mixed with StumbleUpon. It seems that the URL shortening service is no longer the core element behind Bitly and it is just one of the features on the site. Today, on Bitly’s homepage (when you aren’t logged in) it states on the top “Save, share & discover links” and at the bottom it asks with a bit of surprise “Just want to shorten a link?” which pretty much says it all about the new site’s concept. 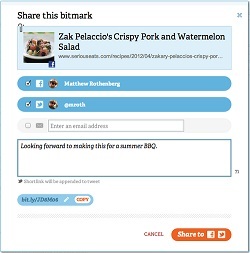 The most prominent new feature is “bitmarks” (Bitly+bookmarks). On the top right corner of the page the user will find the “add a bitmark” box where he could add a bitmark and share it with a comment on Facebook or Twitter and even send it as an email (link shortening included). 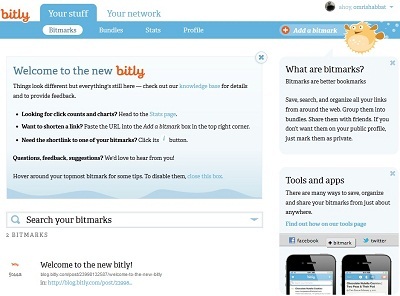 Bitly also presented few other tools for saving links: New boomarklet or “bitmarklet” so the user could add bitmarks easily from anywhere across the web, the option to email a link to the user’s bitmarks, Google Chrome extension and a mobile app for iOS devices. There is also some link analytic Stats feature where the user can track how others have been engaging with the user’s shared links and the link’s total clicks and saves from all across the service. Those of you who shares lots of links would be happy to know that the service now offers fast search capabilities. An interesting new section on the site is “Your network” where the user can connect his Facebook and Twitter accounts and see what bitmarks his friends have shared. All those features creates, as I stated, a deep social layer above Facebook or Twitter and which rounds around links. From going over the comment segment on the blog post, there are mostly negative reactions to the major site’s change. However, whenever this kind of changes first appears it is common that the initial sentiment is negative in general (for example as Pinterest changed its profile pages). Anyways, it will be fascinating to see if eventually Bitly will succeed transforming from a popular URL shortening service to a popular social layer of links.